Russia’s National Association for Innovation and IT Development came up with a Regional Innovation Ranking for 2011 to highlight the achievements of the Russian regions in promoting applied science and innovation. Russia’s National Association for Innovation and IT Development (NAIRIT) has put together a Regional Innovation Ranking for 2011. The study was aimed at highlighting the Russian regions showing the most initiative in promoting applied science and innovation. According to NAIRIT, for the second year running Moscow ranked as the undisputed number one in 2011 among the 83 Russian regions participating in the study. 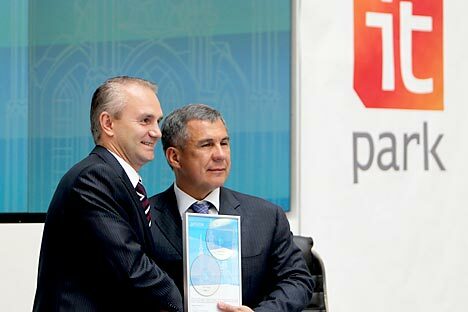 The runner-up was Tatarstan, a dynamic science-intensive region in the mid-Volga area that is developing a Special Economic Zone (SEZ), with four industrial parks, 14 techno-parks and other hi-tech infrastructure. Over the 2010-2011 period, NAIRIT concluded, Tatarstan staged a concerted and successful effort to rise from its previous fourth-position ranking. St. Petersburg also rose two places from its 2010 listing, now ranking third. NAIRIT researchers also praised the spectacular spurt demonstrated by the Yamalo-Nenets autonomous district, a vast trans-polar territory in the northern Urals awash in hydrocarbons. With its burgeoning innovation infrastructure and a boost in R&D support, the region soared an impressive 25 places from its position as 67th in 2010. The Kaluga region, some 100 miles south of Moscow, also showed steady progress, NAIRIT recorded. Positive developments in its budding biotech innovation cluster propelled it from 2010’s 25th place to number 18. In sharp contrast to Yamalo-Nenets, the Moscow Region, a large area surrounding the Russian capital and host to the well-known Skolkovo innovation hub currently under construction, took a steep 17-place nose-dive to number 19, according to the rankers. Overall, the NAIRIT researchers estimated that 42% of the Russian regions improved performance last year; 49% were downgraded; and the remaining 9% kept their 2010 rankings. The Association has not elaborated on its ranking methodology or the benchmark factors used to grade the regions. The NAIRIT effort is one of a number of recent attempts by researchers to identify innovation trends across Russia’s nine time zones. The business monitor RBC Daily, the Moscow-based “Politika” Foundation and the Russian Presidential Academy of National Economy and Public Administration have also been putting together regional innovation rankings for some months. Interestingly, the top five most advanced regions usually vary from ranker to ranker and period to period. In the RBC ranking for 2011, two of the three winners represented Siberia, with the Tomsk region topping the list. In the NAIRIT study, Tomsk is only number five, outpaced at number four by Nizhny Novgorod, a region far outside the top ten most innovative according to RBC. Moscow, acclaimed by NAIRIT the leader for a second consecutive year, was not even close to the top spot in the other 2011 study, emerging as number eight; and RBC awarded the capital only second place in its spring 2012 ranking. Yet both studies were unanimous in placing Tatarstan in second position for 2011.